This is a fun essay about biological terms borrowed from or inspired by Greek, written by a group of (I presume) Greek speakers: Iliopoulos & al (2019), Hypothesis, analysis and synthesis, it’s all Greek to me. We hope that this contribution will encourage scientists to think about the terminology used in modern science, technology and medicine (Wulff, 2004), and to be more careful when seeking to introduce new words and phrases into our vocabulary. First, I like how they celebrate the value of knowing more than one language. I feel like bi- and multilingualism in science is most often discussed as a problem: Either we non-native speakers have problems catching up with the native speakers, or we’re burdening them with our poor writing. Here, the authors seem to argue that knowing another language (Greek) helps both your understanding of scientific language, and the style and grace with which you use it. Non-Greek speakers will, we are sure, be surprised by the richness and structure of the Greek language, despite its often inept naturalization in English or other languages, and as a result be better able to understand their own areas of science (Snell, 1960; Montgomery, 2004). Our favorite example is the word ‘analysis’: everyone uses it, but few fully understand it. ‘Lysis’ means ‘breaking up’, while ‘ana-‘ means ‘from bottom to top’ but also ‘again/repetitively’: the subtle yet ingenious latter meaning of the term implies that if you break up something once, you might not know how it works; however, if you break up something twice, you must have reconstructed it, so you must understand the inner workings of the system. I’m sure it is true that some of the use of Greek-inspired terms in scientific English is inept, and would benefit from checking by someone who knows Greek. However, this passage invites two objections. First, why would anyone think that the Greek language has less richness and structure then English? Then again, if I learned Greek, it is possible that I would find that the richness would be even more than I expected. Second, does knowing Greek mean that you have a deeper appreciation for the nuances of a concept like analysis? Maybe ‘analysis’ as understood without those double meanings of the ‘ana-‘ prefix is less exciting, but if it is true that most people don’t know about this subtlety, this can’t be what they mean by ‘analysis’. So, if that etymological understanding isn’t part of how most people use the word, do we really understand it better by learning that story? It sounds like they think that the word is supposed to have a true meaning separate from how it is used, and I’m not sure that is helpful. So what are some less inept uses of Greek? They like the term ‘epigenomics’, writing that it is being ‘introduced in a thoughtful and meaningful way’. To me, this seems like an unfortunate example, because I can think of few terms in genomics that cause more confusion. ‘Epigenomics’ is the upgraded version of ‘epigenetics’, a word which was, unfortunately, coined at least twice with different meanings. And now, epigenetics is this two-headed beast that feeds on geneticists’s energy as they try to understand what on earth other geneticists are saying. First, Conrad Waddington glued ‘epigenesis’ and ‘genetics’ together to define epigenetics as ‘the branch of biology that studies the causal interactions between genes and their products which bring the phenotype into being’ (Waddington 1942, quoted in Deans & Maggert 2015). That is, it is what we today might call developmental genetics. Later, David Nanney connected it to gene regulatory mechanisms that are stable through cell division, and we get the modern view of epigenetics as a layer of regulatory mechanisms on top of the DNA sequence. I would be interested to know which of these two intertwined meanings it is that the authors like. Judging by the affiliations of the authors, the classification of the paper (by the way, how is this ‘computational and systems biology, genetics and genomics’, eLife? ), and the citations (16 of 27 to medicine and science journals, a lot of which seems to be similar opinion pieces), this feels like a missed opportunity to connect with language scholarship. I’m no better myself–I’m not a scholar of language, and I haven’t tried to invite one to co-write this blog post with me … But there must be scholarship and expertise outside biomedicine relevant to this topic, and language sources richer than an etymological online dictionary? Finally, the table of new Greek-inspired terms that ‘might be useful’ is a fun thought exercise, and if it serves as inspiration for someone to have an eureka moment about a concept they need to investigate, great (‘… but what is a katagenome, really? Oh, maybe …’). But I think that telling scientists to coin new words is inviting catastrophe. I’d much rather take the lesson that we need fewer new tortured terms borrowed from Greek, rather than more of them. It’s as if I, driven by the nuance and richness I recognise in my own first language, set out to coin övergenome, undergenome and pågenome. Let’s keep the tradition of delayed travel posts going! 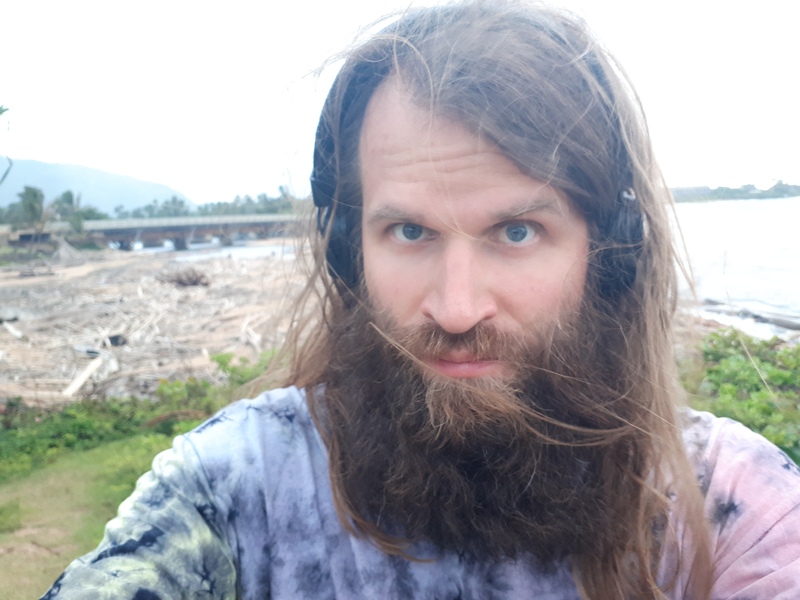 In August last year, I joined Dom Wright, Rie Henriksen, and Robin Abbey-Lee, as part of Dom’s FERALGEN project, on their field work on Kauai. I did some of my dissertation work on the Kauai feral chickens, but I never saw them live until now. Our collaborator Eben Gering was also on the islands, but the closest we got to each other was Skyping between the islands. It all went smoothly until the end of the trip, when a hurricane came uncomfortably close to the island for a while. Here are some pictures. In time, I promise to blog about the actual research too. Look! Chickens by the sea, chickens on parking lots, a sign telling people not to feed the chickens on a sidewalk in central Kapaa! Lots of chickens. I’m not kidding: lots of chickens. Any distinction in principle between qualitative and quantitative characters disappeared long ago, although in the early days of Mendelism it was often conjectured that they might be inherited according to fundamentally different laws. If it is still convenient to call some characters qualitative and others quantitative, it is only to denote that the former naturally have a discontinuous and the latter a continuous distribution, or that the former are not easily measured on a familiar metrical scale. Colors are an example. Differences between colors can be measured in terms of length of light waves, hue, brilliance etc., but most of us find it difficult to compare those measurements with our own visual impressions. Most quantitative characters are affected by many pairs of genes and also importantly by environmental variations. It is rarely possible to identify the pertinent genes in a Mendelian way or to map the chromosomal position of any of them. Fortunately this inability to identify and describe the genes individually is almost no handicap to the breeder of economic plants or animals. What he would actually do if he knew the details about all the genes which affect a quantitative character in that population differs little from what he will do if he merely knows how heritable it is and whether much of the hereditary variance comes from dominance or overdominance, and from epistatic interactions between the genes. Imagine you want to make a Manhattan-style plot or anything else where you want a series of intervals laid out on one axis after one another. 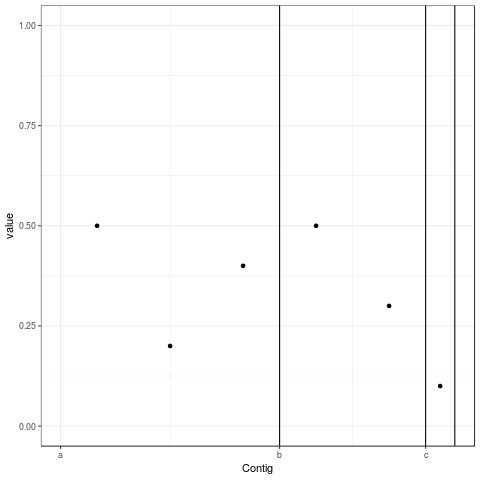 If it’s actually a Manhattan plot you may have a friendly R package that does it for you, but here is how to cobble the plot together ourselves with ggplot2. We start by making some fake data. Here, we have three contigs (this could be your chromosomes, your genomic intervals or whatever) divided into one, two and three windows, respectively. Each window has a value that we’ll put on the y-axis. We will need to know how long each contig is. In this case, if we assume that the windows cover the whole thing, we can get this from the data. If not, say if the windows don’t go up to the end of the chromosome, we will have to get this data from elsewhere (often some genome assembly metadata). This is also where we can decide in what order we want the contigs. Now, we need to transform the coordinates on each contig to coordinates on our new axis, where we lay the contings after one another. What we need to do is to add an offset to each point, where the offset is the sum of the lengths of the contigs we’ve layed down before this one. We make a function that takes three arguments: two vectors containing the contig of each point and the position of each point, and also the table of lengths we just made. Now, we use this to transform the start and end of each window. We also transform the vector of the length of the contigs, so we can use it to add vertical lines between the contigs. Now it’s time to plot! We add one layer of points for the values on the y-axis, where each point is centered on the middle of the window, followed by a layer of vertical lines at the borders between contigs. Finally, we add our custom x-axis, and also some window dressing. I’m sure your plot will look more impressive, but you get the idea. Citing, even in accordance with content, requires context. This is especially important when it happens as part of the article’s argument. Not all citations are a part of an article’s argument. Citations to data, resources, materials, and established methods require less, if any, context. As part of the argument, however, the mere inclusion of a citation, even when in the right spot, does not convey the value of the reference and, accordingly, the rationale for including it. In a recent editorial, the Nature Genetics editors argued against so-called neutral citation. This citation practice, they argue, appears neutral or procedural yet lacks required displays of context of the cited source or rationale for including . Rather, citations should mention assessments of value, worth, relevance, or significance in the context of whether findings support or oppose reported data or conclusions. This flows from the realisation that citations are political, even though that term is rarely used in this context. Researchers can use them to accurately represent, inflate, or deflate contributions, based on (1) whether they are included and (2) whether their contributions are qualified. Context or rationale can be qualified by using the right verbs. The contribution of a specific reference can be inflated or deflated through the absence of or use of the wrong qualifying term (‘the authors suggest’ versus ‘the authors establish’; ‘this excellent study shows’ versus ‘this pilot study shows’). If intentional, it is a form of deception, rewriting the content of scientific canon. If unintentional, it is the result of sloppy writing. Ask yourself why you are citing prior work and which value you are attributing to it, and whether the answers to these questions are accessible to your readers. When Nature Genetics had an editorial condemning neutral citation, I took it to be a demand that authors show that they’ve read and thought about the papers they cite. This piece of advice seems to ask something different: that authors be honest about their opinions about a work they cite. That is a radical suggestion, because if people were, I believe readers would get offended. That is, if the paper wasn’t held back by offended peer reviewers before it reached any readers. Honestly, as a reviewer, I would probably complain if I saw a value-laden and vacuous statement like ‘this excellent study’ in front of a citation. It would seem to me an rude attempt to tell the reader what to think. So how are we to cite a study? On the one hand, we can’t just drop the citation in a sentence, but are obliged to ‘mention assessments of value, worth, relevance or significance’. On the other hand, we must make sure that they are ‘qualified by using the right verbs’. And if citation is political, then whether a study ‘suggests’ or ‘establishes’ conclusions is also political. Disclaimer: I don’t like the 10 simple rules format at all. I find that they belong on someone’s personal blog and not in a scientific journal, given that their evidence for their assertions usually amounts to nothing more than my own meandering experience … This one is an exception, because Bart Penders does research on how scientists collaborate and communicate (even if he cites no research in this particular part of the text). It’s a metaphor, you see. is itself and no-one else. Wouldn’t it be great if we had a way to tell genetic variants that do something to gene function and regulation from those that don’t? This is a Really Hard Problem, especially for variants that fall outside of protein-coding regions, and thus may or may not do something to gene regulation. 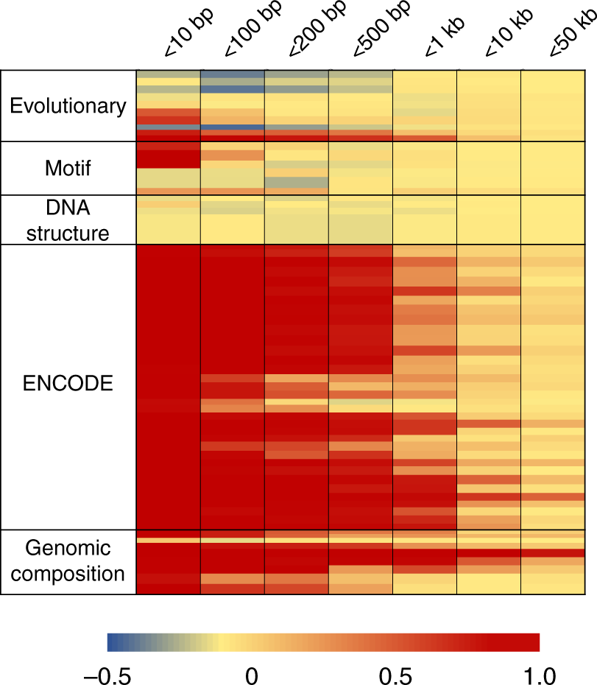 There is a host of bioinformatic methods to tackle the problem, and they use different combinations of evolutionary analysis (looking at how often the position of the variant differs between or within species) and functional genomics (what histone modifications, chromatin accessibility etc are like at the location of the variant) and statistics (comparing known functional variants to other variants). When a new method is published, it’s always accompanied by a receiver operating curve showing it predicting held-out data well, and some combination of comparisons to other methods and analyses of other datasets of known or presumed functional variants. However, one wonders how these methods will do when we use them to evaluate unknown variants in the lab, or eventually in the clinic. This is what this paper, Liu et al (2019) Biological relevance of computationally predicted pathogenicity of noncoding variants is trying to do. They construct three test cases that are supposed to be more realistic (pessimistic) test beds for six noncoding variant effect predictors. Find out which allele of a variant is the deleterious one. The presumed deleterious test alleles here are ones that don’t occur in any species of a large multiple genome alignment. Find a causative variant among a set of linked variants. The test alleles are causative variants from the Human Gene Mutation Database and some variants close to them. Enrich for causative variants among increasingly bigger sets of non-functional variants. In summary, the methods don’t do too well. The authors think that they have ‘underwhelming performance’. That isn’t happy news, but I don’t think it’s such a surprise. Noncoding variant prediction is universally acknowledged to be tricky. In particular, looking at Task 3, the predictors are bound to look much less impressive in the face of class imbalance than in those receiver operating curves. Then again, class imbalance is going to be a fact when we go out to apply these methods to our long lists of candidate variants. Sure, it’s hard to solve this problem with a program that only produces one score per site, but you knew that when you started writing this paragraph, didn’t you? The whole paper is useful, but to me, the most interesting insight is that variants close to each other tend to have correlated features, meaning that there is little power to tell them apart (Task 2). This might be obvious if you think about it (e.g., if two variants fall in the same enhancer, how different can their chromatin state and histone modifications really be? ), but I guess I haven’t thought that hard about it before. This high correlation is unfortunate, because that means that methods for finding causative variants (association and variant effect prediction) have poor spatial resolution. We might need something else to solve the fine mapping problem. Figure 4 from Liu et al., showing correlation between features of linked variants. An alternative approach is to develop a composite score that may improve upon individual methods. We examined one such method, namely PRVCS, which unfortunately had poor performance (Supplementary Figure 11). I thought this read like something prompted by an eager beaver reviewer, and thanks to Nature Communications open review policy, we can confirm my suspicions. So don’t say that open review is useless. Comment R1.d. Line 85: It would be interesting to see if a combination of the examined scores would better distinguish between pathogenic and non-pathogenic non-coding regions. Although we suspect there to be high correlation between features this will test the hypothesis that each score may not be sufficient on its own to make any distinction between pathogenic and non-pathogenic ncSNVs. However, a combined model might provide more discriminating power than individual scores, suggesting that each score captures part of the underlying information with regards to a region’s pathogenicity propensity. Liu, L., Sanderford, M. D., Patel, R., Chandrashekar, P., Gibson, G., & Kumar, S. (2019). Biological relevance of computationally predicted pathogenicity of noncoding variants. Nature Communications, 10(1), 330. A blog about genetics and sundry things. En blogg om genetik och annat.